Santo Domingo.- If you live in Valle Nuevo, Constanza, Jarabacoa or near Alto Bandera in the foothills of the Central Mountain Range, have a heavy blanket and coat handy, because temperatures will fall as low as zero degrees Celsius (32 F.) this weekend, according to the National Weather Office (Onamet) Fri. forecast. Temperatures will drop on Pico Duarte -just 50 miles from the Caribbean- to below zero Celsius, said meteorologist Julio Ordonez. Santo Domingo.- Si vive en Valle Nuevo, Constanza, Jarabacoa o cerca de Alto Bandera en las estribaciones de la Cordillera Central, tenga una manta y un abrigo pesados a mano, porque las temperaturas bajarán a cero grados Celsius (32 F.). este fin de semana, de acuerdo con el pronóstico del Viernes 16 de la Oficina Meteorológica Nacional (Onamet). Las temperaturas caerán en el Pico Duarte -sólo a 50 millas del Caribe- a menos de cero grados Celsius, dijo el meteorólogo Julio Ordoñez. “The anticyclone circulation that generates a wind from the Northeast combined with a high pressure system, will influence temperatures to descend considerably even in Santo Domingo, where it’s expected to reach a chilly 18 degrees Celsius,” he said. He said Constanza Valle and Jarabacoa, the temperatures will drop as low as to 8 degrees (C.),” he adding that that in Alto Bandera (just 50 miles from the Caribbean) and Valle Nuevo will reach zero degrees in the early morning. "La circulación anticiclónica que genera un viento del noreste combinado con un sistema de alta presión, influirá en las temperaturas para descender considerablemente, incluso en Santo Domingo, donde se espera que alcance un frío de 18 grados centígrados", dijo. Siempre de acuerdo con la misma Fuente, en el Valle de Constanza y Jarabacoa, las temperaturas bajarán a 8 grados (C) ", y agregó que en Alto Bandera (a solo 50 millas del Caribe) y Valle Nuevo llegarán a cero grados en la madrugada. Santo Domingo.- If you live in Valle Nuevo, Constanza, Jarabacoa or near Alto Bandera in the foothills of the Central Mountain Range, have a heavy blanket and coat handy, because temperatures will fall as low as zero degrees Celsius (32 F.) this weekend, according to the National Weather Office (Onamet) Fri. forecast. Temperatures will drop on Pico Duarte -just 50 miles from the Caribbean- to below zero Celsius, said meteorologist Julio Ordoñez. “The anticyclone circulation that generates a wind from the Northeast combined with a high pressure system, will influence temperatures to descend considerably even in Santo Domingo, where it’s expected to reach a chilly 18 degrees Celsius,” he said. He said Constanza Valle and Jarabacoa, the temperatures will drop as low as to 8 degrees (C.),” he adding that that in Alto Bandera (just 50 miles from the Caribbean) and Valle Nuevo will reach zero degrees in the early morning. Definitions of Santo Domingo.- If you live in Valle Nuevo, Constanza, Jarabacoa or near Alto Bandera in the foothills of the Central Mountain Range, have a heavy blanket and coat handy, because temperatures will fall as low as zero degrees Celsius (32 F.) this weekend, according to the National Weather Office (Onamet) Fri. forecast. Temperatures will drop on Pico Duarte -just 50 miles from the Caribbean- to below zero Celsius, said meteorologist Julio Ordoñez. “The anticyclone circulation that generates a wind from the Northeast combined with a high pressure system, will influence temperatures to descend considerably even in Santo Domingo, where it’s expected to reach a chilly 18 degrees Celsius,” he said. He said Constanza Valle and Jarabacoa, the temperatures will drop as low as to 8 degrees (C.),” he adding that that in Alto Bandera (just 50 miles from the Caribbean) and Valle Nuevo will reach zero degrees in the early morning. Synonyms of Santo Domingo.- If you live in Valle Nuevo, Constanza, Jarabacoa or near Alto Bandera in the foothills of the Central Mountain Range, have a heavy blanket and coat handy, because temperatures will fall as low as zero degrees Celsius (32 F.) this weekend, according to the National Weather Office (Onamet) Fri. forecast. Temperatures will drop on Pico Duarte -just 50 miles from the Caribbean- to below zero Celsius, said meteorologist Julio Ordoñez. “The anticyclone circulation that generates a wind from the Northeast combined with a high pressure system, will influence temperatures to descend considerably even in Santo Domingo, where it’s expected to reach a chilly 18 degrees Celsius,” he said. He said Constanza Valle and Jarabacoa, the temperatures will drop as low as to 8 degrees (C.),” he adding that that in Alto Bandera (just 50 miles from the Caribbean) and Valle Nuevo will reach zero degrees in the early morning. 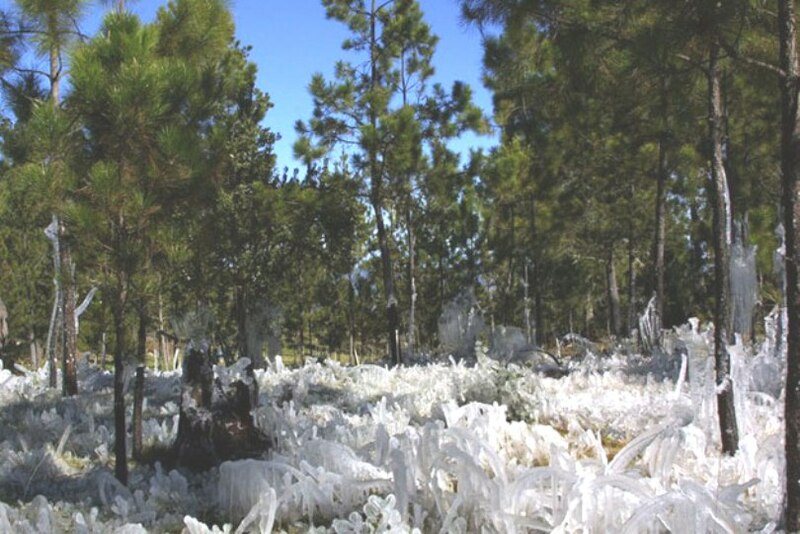 Examples of Santo Domingo.- If you live in Valle Nuevo, Constanza, Jarabacoa or near Alto Bandera in the foothills of the Central Mountain Range, have a heavy blanket and coat handy, because temperatures will fall as low as zero degrees Celsius (32 F.) this weekend, according to the National Weather Office (Onamet) Fri. forecast. Temperatures will drop on Pico Duarte -just 50 miles from the Caribbean- to below zero Celsius, said meteorologist Julio Ordoñez. “The anticyclone circulation that generates a wind from the Northeast combined with a high pressure system, will influence temperatures to descend considerably even in Santo Domingo, where it’s expected to reach a chilly 18 degrees Celsius,” he said. He said Constanza Valle and Jarabacoa, the temperatures will drop as low as to 8 degrees (C.),” he adding that that in Alto Bandera (just 50 miles from the Caribbean) and Valle Nuevo will reach zero degrees in the early morning. Translations of Santo Domingo.- If you live in Valle Nuevo, Constanza, Jarabacoa or near Alto Bandera in the foothills of the Central Mountain Range, have a heavy blanket and coat handy, because temperatures will fall as low as zero degrees Celsius (32 F.) this weekend, according to the National Weather Office (Onamet) Fri. forecast. Temperatures will drop on Pico Duarte -just 50 miles from the Caribbean- to below zero Celsius, said meteorologist Julio Ordoñez. “The anticyclone circulation that generates a wind from the Northeast combined with a high pressure system, will influence temperatures to descend considerably even in Santo Domingo, where it’s expected to reach a chilly 18 degrees Celsius,” he said. He said Constanza Valle and Jarabacoa, the temperatures will drop as low as to 8 degrees (C.),” he adding that that in Alto Bandera (just 50 miles from the Caribbean) and Valle Nuevo will reach zero degrees in the early morning.